The removal of the Abomination of Desolation from the Temple. The final destination of the Antichrist. The final destination of the False Prophet. The judgment of the Gentiles. The resurrection of the Old Testament Saints. The resurrection of the Tribulation Saints. The pivotal event, which signals the mid-point of the Great Tribulation, is the Antichrist’s takeover of the Jewish Temple. He breaks his covenant with the Jews, and declares himself “The Almighty God” (II Thessalonians 2:4). He also begins a serious persecution of the Jews, which will last for 1,260 days. The False Prophet sets up an inanimate image of the Antichrist in the Temple and Satan, through the False Prophet, causes it to become alive. The Antichrist is in control of the world for those 1,260 days and then he will be killed. The image stays in the Temple for additional thirty days. The desecration of the Jewish Temple continues an additional thirty days beyond the end of the Great Tribulation. It will then be destroyed, which brings the Abomination of Desolation to an end. It is not clear why God allows the Abomination of Desolation to remain in the Temple for 30 days after the Great Tribulation ends. The Olivet Discourse of Jesus to His inner circle of Peter, James, John, and Andrew comes to an end with the Judgment of the Gentiles. Even though a significant number of Gentiles will be killed during the Great Tribulation (and their armies will be slaughtered in the Campaign of Armageddon) some will make it through alive. They will be gathered together for the purpose of a special judgment. This passage confirms the timing of the judgment, which will be after the Second Coming of the Messiah, when the Throne of David will be set up as described in verse 31 above. This judgment that will take place just outside the City of Jerusalem, in the Valley of Jehoshaphat, which lies between the city and the Mount of Olives. 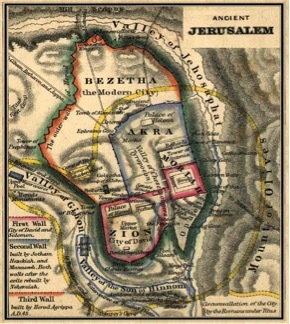 Ancient City of Jerusalem and Valley of Jehosaphat. Joel also confirms that this judgment is to occur near the time of the restoration of the Nation Israel, which is at the end of the Great Tribulation. All the Gentiles surviving after the war will be gathered into the Valley of Jehoshaphat for the judgment. This is the same place on the east of the Temple Mount next to the Mount of Olives where the final battle took place. The term “Gentiles” is the same as “all nations”. This judgment will be for the purpose of determining their individual final destination of eternal life or eternal hell. Therefore, it is a very serious event. The basis for the judgment will be how they treated the Jews during the Tribulation. The sins cited by Joel include: scattering the Jews in the middle of the Great Tribulation, parting the land during the Campaign of Armageddon, and selling the Jews into slavery (Zechariah 14:1-2). Jesus (“Son of man”) is the judge who will sit on a throne in the all His glory in the Valley of Jehoshaphat. Jesus describes those who helped His “brethren”, the Jews, during the Great Tribulation as “sheep”. Remember, the church had not yet been formed when Christ’s Olivet Discourse was given. Therefore, His usage of the term “brethren” in this context refers to the Jews. These Gentiles will be putting themselves in mortal danger, just as it was during World War II when the Nazis were hunting the Jews and killing those non-Jews who hid or aided them. The Jews will flee into the wilderness without provisions. The pro-Jewish “sheep” will provide them with food, clothing and shelter. They will visit them in prison, and in general show kindness toward them. The result of their judgment is being given permission to enter into the Messianic Kingdom. It is the “sheep” Gentiles who will be involved in the destruction of Babylon (Isaiah 13:1-5). They will be the “resistance fighters” who are instrumental in overthrowing the one-world government that will be headquartered at Babylon. Some have tried to interpret the term “brethren” as referring to saints in general, but this makes the passage meaningless. If the “brethren” are saints in general, then who are the “sheep” since they too have eternal life? It would be very confusing to make both the “sheep” and the “brethren” as saints of the same order. From this context alone, it should be very evident that the “brethren” must refer to Jewish people because the saints are the “sheep” and the unsaved are the “goats”. Furthermore, the parallel passage of Joel 3:1-3 makes it certain that these “brethren” are the Jewish people of the Great Tribulation. The term “brethren” here is used in the sense of “brethren in the flesh.” The fact that only Matthew records this segment of the Olivet Discourse also teaches the same truth. Matthew’s gospel was directed at a Jewish audience, and since his is the most “Jewish” of the Gospels, his primary concern has been how the Messiah’s coming will affect the Jewish people. The “sheep”, which are pro-Jewish, are clearly stated to be the “righteous” ones. Will they be saved because they are pro-Jewish? This cannot be true because that would make their salvation be based on their works, and not the work of God. This passage is an example of James 2:14-26, that distinguishes between perfecting one’s faith through our works, as compared to one who is basing their salvation only on faith without any works. Because these Gentiles are already believers in the Lord Jesus Christ, they will refuse to do the commands of the Antichrist to destroy the Jews. So, while Jews will undergo a great persecution, these believing Gentiles will do what they can to help the Jews under these conditions. A believer will follow Christ’s commandments, and will not follow the Antichrist. Their works toward the Messiah’s “brethren” will prove their faith. They will be allowed to enter into the Messianic Kingdom because they are saved Gentiles, and they will be the ones to populate the Gentile nations during the Messianic Kingdom (vv.34-40). They will be killed and sent directly to Hell. This judgment is not judging them on works, but whether or not they believed in the Messiah, and sends those who harmed the Jews to Hell. The text states that the Antichrist will be “cast alive” into the Lake of Fire. The Antichrist is killed at the end of the Great Tribulation and while his body will not be buried, his soul will be in Hell (Habakkuk 3:13b; II Thessalonians 2:8; Isaiah14:3-11; 16-21). As armed forces of the Antichrist flee Christ’s slaughter, his body will be trampled under their feet (Isaiah 14:19-21). So if the text states that he will be “cast alive into a lake of fire”, he must come back to life in order for that to occur. There is the Second Resurrection and it only applies to the resurrection of the damned (those who did not accept Christ when they had the opportunity), which like the First Resurrection also comes in stages. Jesus, the second person of the Holy Trinity, is the “first fruits” of the First Resurrection. Interestingly, the Antichrist will be the “first fruits” of the Second Resurrection. The result of his resurrection will end with his eternal destiny in the Lake of Fire. The “lake of fire burning with brimstone” is that which Christ referred as Gehenna, and is also called the Lake of Fire (Matthew 5:22, 29-30, 10:28, 18:9, 23:15, 33; Mark 9:43, 45, 47; Luke 12:5). The Greek work for the Lake of Fire is Gehenna, and is named for the Valley of Hinnom just south of Jerusalem. It was at this site that the Jews offered their children to god Molech (II Kings 23:10; Jeremiah 7:31; 19:2-6). In later times it served as a continually burning garbage dump, and therefore provided the imagery that the Bible uses to describe the place of everlasting punishment. The Lake of Fire is where all those who do not believe in Christ will reside forever. The Lake of Fire is where the contents of Hell will be deposited. Hell is a place of a spiritual punishment. The Lake of Fire will be a place of punishment for the resurrected bodies of the unbelievers and their spirits. Being thrown into the Lake of Fire is the Second Death, and is the final destination of the wicked. According to Revelation 19:20 the False Prophet will have a counterfeit gift of performing miracles for the sole purpose of deceiving the world so that they worship the Antichrist (beast) and take his mark of 666. He will be “cast alive” into the Lake of Fire along with the Antichrist. These two members of the “unholy trinity” (the Antichrist masquerading as the counterfeit “son”, and the false prophet masquerading as the counterfeit “holy spirit”) will the only occupants for the first 1,000 years that the Lake of Fire will be operational. What a appropriate destiny for the two men who instituted Hell on earth for seven years! Satan, who masquerades as the counterfeit father in the “unholy trinity”, will be cast into the abyss. Here we see the binding of Satan, who was cherub and of the highest order of celestial beings in Heaven. The one who does the binding is a common angel, who is the lowest order of celestial beings in Heaven. How fitting for Satan who was the highest of the highest rank of celestial beings to be bound by one from the lowest rank! Satan will be bound for 1,000 years, which is the duration of the Millennial Kingdom on earth. He will no longer be free to be the great deceiver of mankind. He will reside in the Abyss. The binding is done with the promise that Satan will be released for a short time to again test mankind at least one more time. The New Testament tells us that this is the temporary dwelling place of the imprisoned demons (Revelation 9:1-21). In classical Greek it is the adjective abussos. It refers to an “unfathomable or boundlessly deep place”. Many of the demons that Jesus expelled from the earth were committed to the abyss. They dreaded going there before their appointed time (Luke 8:31). Millions of them will be let loosed during the Great Tribulation in two separate invasions to wreck havoc on the earth. At this time they begin to appear so the human population can see them. Up until this time, when the fifth and sixth trumpets are sounded, the demonic world is unseen to the human eye (Revelation 9). According to verse five, the resurrection of the Great Tribulation saints completes the First Resurrection. It is separated from the Second Resurrection by one thousand years. The whole point of verse six states that the First Resurrection involves only believers, and that is why it is a “blessed” event for those who participate in it. This verse, along with many others, further refines and gives explicit instruction in how to actualize our faith. We must tell others what has taken place in our hearts. It is similar to being obedient, and carrying out the commandment to be baptized. Both are outward signs attesting to the transformation that the Lord has brought about within us. So those, who have done this prior to the Great Tribulation, will have already gone up to Heaven to meet the Lord in the air at the time of the Rapture (I Thessalonians 4:16-17). This passage draws a very clear distinction between the righteous and the unrighteous. Within the context of the twelfth chapter of Daniel, this verse is speaking of a particular time at the “end.” It is addressed to the Jews who are identified as “your people” (Daniel 12:1). Only the righteous will be resurrected at this time to partake in the blessing of the Millennial Kingdom. These are also known as “the friends of the bridegroom” spoken of by John the Baptist (John 3:29). 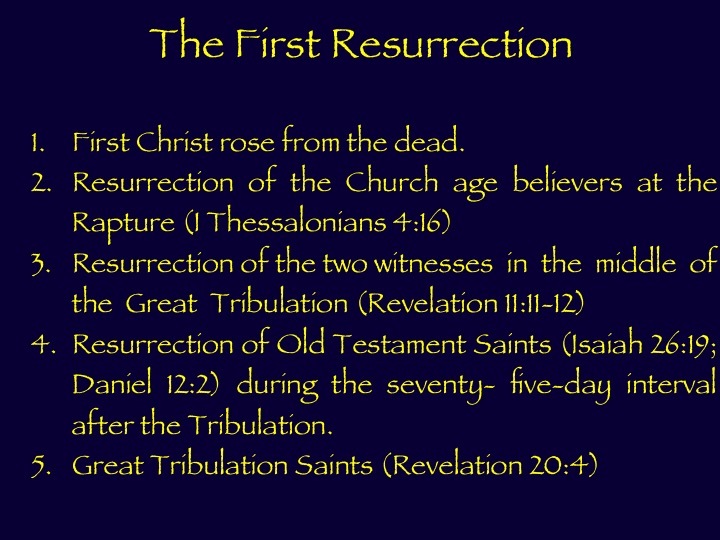 Since the context of Daniel chapter twelve is speaking of the events after the Great Tribulation, it is at that time that the Old Testament saints will be resurrected. Here the apostle John sees two groups of people co-reigning with the Lord Jesus. The first group is those who already had received their judgment for their works from Christ. The judgment, called the Bema Seat Judgment, is referenced in Romans 14:10 and 2 Corinthians 5:10. This will be the Church age saints who are resurrected at the Rapture of the Church. They receive the judgment of their works, and their rewards, right after they enter Heaven from Christ (1 Corinthians 3). The second group is identified as those souls who have been beheaded for the testimony of Jesus. They were beheaded because they would not worship the Antichrist, nor would they consent to receive the mark of the Beast (666). These are the Tribulation saints. They go into the Millennial Kingdom with Christ. The Father of the Groom made the arrangement for the Bride and paid the bride price. In this case the price was the blood of Jesus (Ephesians 5:25-29). The fetching of the Bride is when she is ready and waiting to be escorted by her Bridegroom to the home of his father. This is comparable to the Rapture of the Church (I Thessalonians 4:13-18). The marriage ceremony of the Bride to the Groom, or when the Church weds the Messiah happens immediately after arriving at his father’s house (Church age saints are now in Heaven with Christ) (Revelation 19:6-8). The wedding, or marriage feast, is the last event of the sequence and lasts for seven days. The Marriage Feast of the Lamb is the event that begins the Messianic Kingdom. 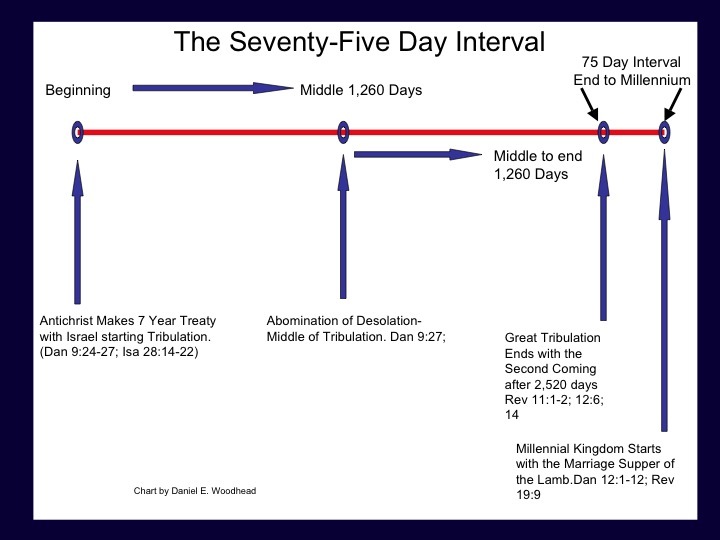 So the Great Tribulation has ended, and the final events have been accomplished during the seventy-five day interval. This concludes with the Marriage feast of the Lamb Jesus who welcomes all believers into His Kingdom. Fruchtenbaum, Arnold G. The Footsteps of the Messiah: A Study of the Sequence of Prophetic Events. San Antonio, TX: Ariel Ministries. 2004. Pentecost, J. Dwight. Things to Come. Grand Rapids, MI: Zondervan Publishing House. 1958. Gabelein Arno C. Gabelein’s Concise Commentary on the Whole Bible. Neptune, NJ: Loizeauz Brothers. 1970. Peters, George H. H. The Theocratic Kingdom in Three Volumes. Grand Rapids, MI: Kregel Publication. 1952. Unger, Merrill F. Great Neglected Bible Prophecies. Chicago, IL: Scripture Press Book Division. 1955. Walvoord, John F. Daniel The Key to Prophetic Revelation. Chicago: The Moody Bible Institute. 1971.